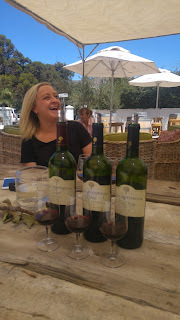 A wine friend and I visited two wineries in Durbanville area today; Hillcrest and Klein Roosboom. The last time I went to Klein Roosboom was on my birthday a few years ago, and prior to that when they had a Sauvignon Blanc wine festival in 2011. When my friend suggested we go there today I thought it was about time I revisited the place. We walked in and went all the way down to the end of the tasting room. 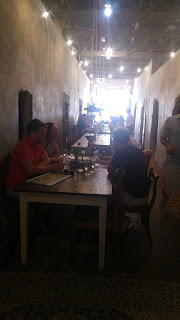 As we walked through the room, past the long table in the middle of the room, struggling to get past, we looked in to each room on the side, where people could enjoy a tasting in "private". As I walked past each room and peered in to see how each room was uniquely decorated, I felt like I was walking through a brothel. It was weird. So weird, I didn't take photos of the rooms, it didn't seem right to peer in to a room and take a photo of the people in the room. The concept is cool, but it just had a weird feeling as you look in and people look up at you, wishing you weren't looking. After walking all the way in to the tasting room, struggling to get past the tables and the staff serving them, we walked all the way back out, yet again looking in to every room with different themes in each one, and sat outside for our tasting. I felt much better once outside. It was spacious and lighter than inside. 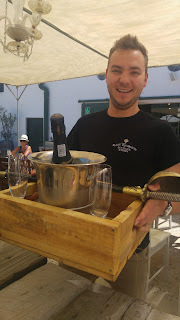 My friend had done a sabrage last time she was at this winery, so we asked to do it this time also, which we did. You pay for the bottle of MCC and to experience the sabrage is at no extra cost. It was awesome getting to do it with the sabor and the MCC was delicious too. They had sold out of their own MCC, so they alternate with various MCCs in the area. This in my opinion is pretty dam cool that they are willing to show a neighbours wine at their own tasting room. I take my hat off to them. There are few wineries that would do this. The MCC was very delicious also. 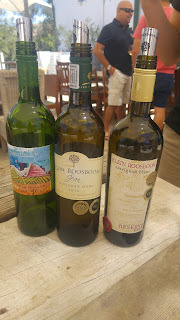 Next time we visit I look forward to tasting the Klein Roosboom MCC. 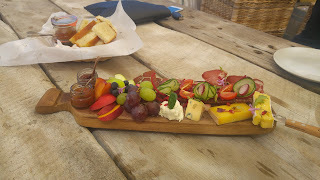 The tasting was amazing. The guy serving us was so passionate and enthusiastic and informative. The wines were ok, but not great enough to buy a bottle. 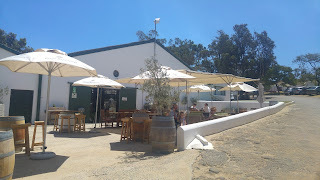 Last time I visited this place I thought the Sauvignon Blanc was nice and did buy a bottle that time. 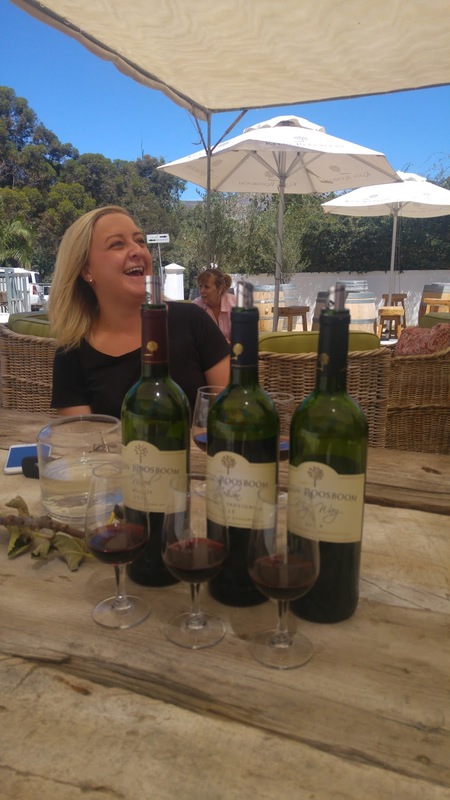 As you would know, wine is one of those things that is subjective, and not everyone is going to like the same wine. I loved the experience here so much that I would still come back. We followed the tasting with a cheese and charcuterie board. This was divine. This is a very nice option for if you are visiting the Durbanville wine region. We had a great time and hope you will too.